A report by Blue Cross Blue Shield (BCSBS) analyzed the growth in specialty drug costs from 2013 to 2014 through a sample size of about 70.5 million BCBS members per year. 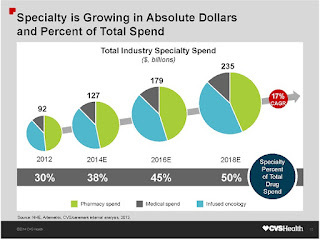 The analysis revealed a 26% increase in the annual spending of specialty pharmacy from 2013 to 2014. The increased costs of specialty drug treatments, including the price and selection of drugs, were found to be the main drivers of spending growth. Annual specialty drug spending was found to be 17% higher per member in the individual market compared with the employer market in 2014. The main difference between these markets was the utilization rates by condition, which was higher for individual members in viral infections, cancer, and hepatitis treatments. This did not include multiple sclerosis or inflammatory conditions. 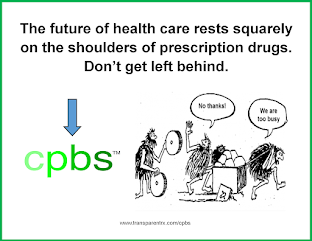 The study authors said that in order for specialty drugs to remain sustainable, they must be affordable to consumers. The report included 15 of the most expensive or common specialty drug categories, which account for more than 80% of total specialty pharmacy costs. Drugs used to treat cancer, inflammatory conditions, multiple sclerosis, hepatitis, and HIV are the 5 highest costing drug categories. 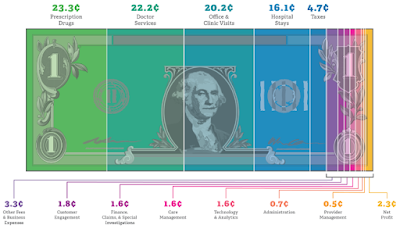 The 10 other drug categories represented smaller contributions to overall expenditures and were grouped in the “other” category. When the categories were broken down, the study revealed that about $14.6 billion was spent on specialty pharmacy drugs for the top 15 categories in 2013, about two-thirds of which treat multiple sclerosis, cancer, and inflammatory conditions. For 2014, the total spending increased 26% to $18.4 billion. Although spending increased in each of the drug categories, hepatitis C specifically rose 612%, and as a result of the introduction of new drugs, there was a $29 annual increase per member.